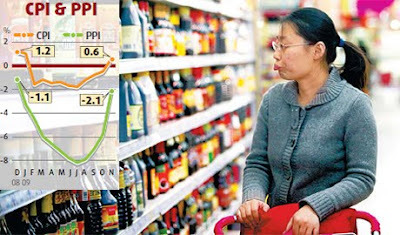 China Daily reports that Chinese CPI grows first time since Jan. Predicting where inflation statistics (CPI numbers) are going isn't hard. Back on November 17, I predicted that Chinese (and world) CPI numbers were about to turn positive. The reason CPI turned negative last year was the collapse of commodities. Oil and agricultural commodities started trading at lower prices than they did a year earlier, which drove the cost of food and gas down. However, this November things are about to change. Below is a chart of oil prices last year. See the price plunged from $90 in October to $60 in November? Oil prices are now higher at $80, which is $20 more than a year ago. Higher year on year commodity prices will quickly start showing up as positive CPI numbers around the world and in China. As predicted, Chinese CPI turned positive in November, but this is just the beginning. 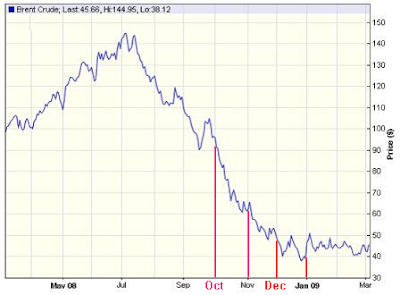 Oil (and other commodities) continued falling in December last year and then averaged around $45 out in Early 2009. With oil prices now around $75, nearly double what they were in January 2009, we are going to see some serious inflation in CPI numbers going forwards, especially with 2010 Food Crisis driving up food prices. Imarketnews reports that the next round of overheating has begun in China. BEIJING (MNI) - China's economy is again flirting with the risk of overheating, a central bank researcher warned in comments published Monday. People's Bank of China researcher Jiao Jinpu was quoted by the official China Securities Journal as saying that 2010 will see the "ideal situation" of high growth and low inflation, but warned that monetary aggregates are already pointing to overheating. "Looking at monetary liquidity and its flows, the next round of overheating has begun," he said. China's economy is expected to comfortably meet the government's growth target of around 8% this year, though some economists warn that the cost of this will be felt in a fresh round of bad loans in the banking system and a severe excess capacity problem in certain industries. Broad money, as measured by M2 growth, accelerated to a record 29.74% at the end of November while M1 also hit a record at 34.63%. M1 growth, in particular, is linked to increases in inflation with a time lag, the PBOC has warned in the past. The PBOC has been reducing the volume of its sterilization operations in recent weeks though bond traders in the interbank market expect biweekly auctions to increase in size in the coming weeks as the central bank agrees to pay increasing amounts to holders of its paper. China's increasing supply of Yuan means there is a lot more money is chasing its domestic supply of commodities. As a result, the prices of commodities in China are higher than the rest of the world, and this price imbalance is leading to record commodity imports (Chinese producers are buying commodities abroad rather than pay higher domestic prices). Nogger reports about huge soybean exports to China. Whilst not entirely unexpected, Greece getting another downgrade from S&P; is also knocking the euro. Chinese export growth is calculated year on year, and you can clearly see in the chart below where the 13.8 percent October fall in exports comes from. By looking at what exports were a year ago and comparing them with the latest monthly imports, it is possible to get a good idea where Chinese export growth is headed. For example, looking at the chart above, Chinese export is 100% guaranteed to turn STRONGLY positive in January and February 2010, which will lead to pressure to appreciate the yuan. Investors.com reports about China's Reluctance To Let Yuan Rise. China's Reluctance To Let Yuan Rise Is Mixed Bag For U.S.
Chinese leaders have so far resisted U.S. and global calls to let the yuan rise vs. the dollar. At least from their perspective, they see good reasons to keep their currency steady for the time being. After letting the yuan rise 20% vs. the dollar in the three years to mid-2008, Beijing put the clamps on further gains as the global recession began pummeling the nation's export-heavy economy. A weak yuan makes Chinese exports cheaper. Critics say that's forcing American companies offshore, eroding support for relaxing global trade rules and fanning trade disputes. "The world trading system is going to blow up, or the U.S. economy is going to totally deindustrialize" [Too late. The US economy is already pretty much deindustrialize] unless China loosens controls on its currency, said Peter Morici, a University of Maryland business professor and a former chief economist at the U.S. International Trade Commission. China's monthly trade surplus with the U.S. jumped 9.2% in September to $22.1 billion as the reviving American economy sucked in more inexpensive Chinese goods. "We're getting very close to the tipping point," Morici said. China holds down the yuan's value by using cash from its trade surplus to buy Treasuries. If Beijing lets the yuan rise, it may not need to buy as much U.S. debt. That could push up interest rates and complicate Washington's efforts to finance its huge budget deficit, and undercut a housing recovery. "The U.S. government needs help from the Chinese to support our government debt, and China seems to be one of the only other countries that's empowered to buy U.S. Treasuries at this point," said Thomas di Galoma, head of U.S. fixed income rates trading at Guggenheim Partners. That may be one reason why President Obama didn't press too hard on the issue during his China visit last month. When China appreciates yuan in response to 2010 Food Crisis, it will do more than damage the US treasury market. More importantly, "cheap Chinese consumer goods" will stop being so cheap anymore. Prices will jump at Walmart and other retailers around the world, leading CPI numbers everywhere into the double digits. Businessweek reports that new global role ahead for Chinese yuan. (Bloomberg) — Hong Kong's former central bank chief Joseph Yam said that the yuan can become the "third pillar" of the global monetary system as deteriorating public finances erode confidence in the dollar and the euro. "Large budget deficits and public debt, and structural problems in the financial system, mean that the two pillars are not resting on sound foundations," he said at a financial conference today in Beijing. "There is a need for a third currency to serve as a third pillar, which would also give an opportunity for the two weak pillars to heal." China is promoting greater use of the yuan overseas after Premier Wen Jiabao expressed concern in March that a weakening dollar was eroding the value of the nation's $2.3 trillion in foreign-exchange reserves. The government should allow foreign financial companies and importers to purchase yuan more freely for investment and trade, Wu Xiaoling, a former deputy governor of the People's Bank of China, said at the conference. China this year allowed 365 companies in Shanghai and the southern province of Guangdong to use yuan in cross-border trade with Hong Kong and members of the Association of Southeast Asian Nations from July 2. The government in October sold 6 billion yuan ($879 million) of bonds in Hong Kong to help elevate the "international status" of its currency. In order to prevent a collapse of international trade next year as the dollar collapse (See 2010 Food Crisis), China will be forced to allow the settlement of cross-border trade in yuan as well as allowing financial companies and importers to purchase yuan more freely for investment and trade. In effect, the dollar's instability in 2010 will for the Chinese yuan to assume the role of reserve currency. Needless to say, this will compound the dollar's troubles, accelerating the currency's freefall. Yuan appreciation would also imply the next oil shock.... and that would have negative effects on China's Asian trade partners, too. If oil prices go way below 70 US$, I think China will reconsider to let the Yuan appreciate... so cuase and effect may be exactly the other way round: a weak US economy reduces the price of oil and the trade deficit with Cina... two reasons to let the US$ finally go to hell. Very good analysis. However, DON'T YOU EVER READ THE COMMENTS?? As Jimmy pointed out on 12/21 you have an incomplete sentence in your conclusion where you state "The will cause the ." Would you be so kind as to complete your thoughts and respond to your readers? "The will cause the" was something I forgot to delete. Not the yuan appreciation will trigger the inflation. The gun was loaded by FED, pourring dollar all over the world. The chineses will only pull the trigger when the time comes. Why nobody sais anything about food inflation in nord america? why we care about prices in india and china? you do not need any CPI to see that food price almost doubled in 3 years. Aaron Krowne good question. For me it's still up in the air if China will continue it's stimulus and expanding credit programs or why they would choose to do so. I don't like it when people say China can't consume what the US consumes. That is not true. China doesn't need the US to consume it's products, it can consume it's products on it's self. But I do understand that it is still a choice whether China chooses to increase domestic consumption/expansion of credit or not and I'm not sure if they will or not, or why. US consumerism being dead might be one factor but I'm still not sure. It's a good question. Why would China expand credit so much over this past year only to discontinue it's expansion of credit/domestic consumption? I don't know, good question. It seems to be a culmination of events that will lead to the ultimate demise of the U.S. dollar. The chinese seem to be saying that since they are currently getting less dollars from exports to the U.S. that they have less of a need to buy U.S. treasuries with those dollars. This is one upward pressure on U.S. interest rates and thus holders of U.S. bonds, which leads to selling of U.S. dollars. 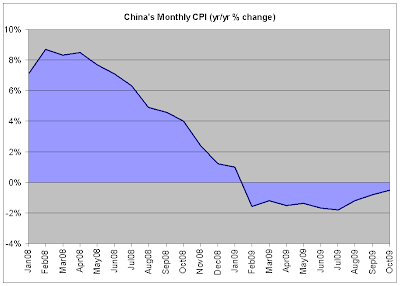 The other problem is a possible upcoming food price inflation in China. However, in the past, China has had much higher food price inflation without having to strengthen their currency due to public discomfort. On the other hand, what Numonic said about China not needing the U.S. is correct. If China let it's currency strengthen then the people in China can make up for the lost export business because they will be more able to purchase the products that they currently ship to us (in dwindling numbers). I think that the chinese are calculating the best time to strengthen their currency, and it may be soon. But keep posting, you will attract other foreign investors with your great knowledge!